For the past several years Virginia and I have had marsh rabbits living in our 'front yard'. I was surprised to learn that they will inhabit the beach dunes since I had usually seen them in proximity to the intercoastal waterway. Marsh rabbits can be found near freshwater marshes and estuarine areas throughout much of Florida with the range extending from the panhandle up the coastal plain into Virginia. Primarily nocturnal, they can often be seen foraging in the morning or early evening. The tails are smaller than cottontails and dark on the bottom. Also the ears are shorter and rounder on marsh rabbits. Just the other day I discovered that they apparently like seaside goldenrod sprouts, as one of the patches in the yard was neatly trimmed at about two inches tall. A few days after hurricane Matthew passed by, we were pleased to see bunny tracks on the now flattened dune area proving that the marsh rabbits had survived the storm surge that had inundated the area were they are usually seen. Spring has brought a resurgence on the dunes, which through the winter mostly only had vegetation that I planted since the hurricane. The searocket has sprouted in dense patches from seeds buried in the sand or caught in the storm wrack that I had placed on the beach to catch the blowing sand in an attempt at beach rebuilding. The seaweed in the wrack also makes an excellent fertilizer for the searocket, a plant uniquely adapted to living in a dynamic environment. The name refers to the rocket-shaped fruits on this plant of beaches and dunes with various species found throughout the world. These rockets are two staged, each containing at least one seed. The lower stage remains on the plant to repopulate the same area, while the upper stage breaks off to be dispersed, often by water, to seed new areas. The name might also refer to this being a coastal member of the mustard family - Brassicaceae - that includes arugula or roquette. Searocket has small four-petaled white to lavender flowers. The plants are typically sprawling, with fleshy leaves that may be wavy edged or deeply lobed. There are two species in Florida, Cakile lanceolata occurring on both coasts, and Cakile edentula subspecies harperi on the east coast and up to the outer banks of North Carolina. 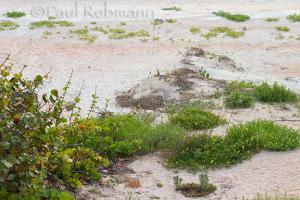 Another plant of beach dunes and coastal thickets is Sea Rosemary, Heliotropium gnaphalodes. It is also known as Sea Lavender, a name it shares with a completely different plant, Limonium carolinianum of brackish marshes, salt flats, mangrove swamps and coastal strands. I purchased this sea rosemary at a native plant sale a week after hurricane Matthew and it is growing nicely. It is a Florida endangered plant that naturally occurs just south of Volusia County, from Brevard County down into the keys. The genus name refers to the form of the flowers that grow in an arc and appear to be arching towards the sun, like its relatives including scorpionstail.